Mechanicsburg’s Jake Edwards (33) attacks off the dribble on Tuesday against Greeneview. The Indians had little success shooting the ball early against the Rams, leaving dribble penetration less effective against a defense that was packed in. That changed in the second half, when the home team made a couple of outside jumpers and forced the defense to extend. 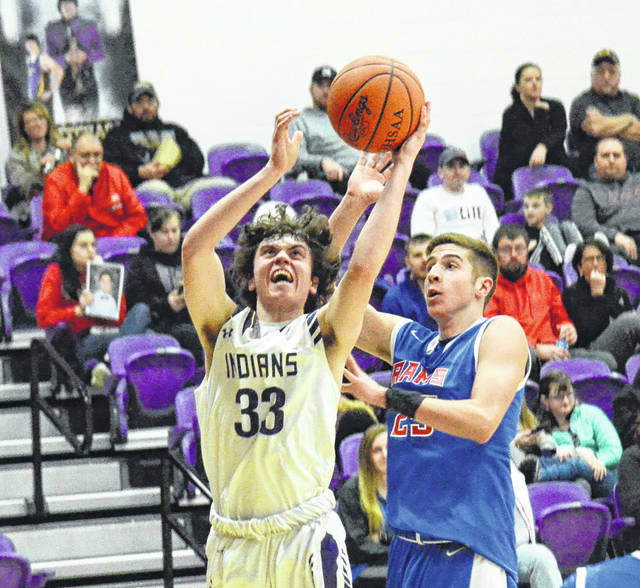 MECHANICSBURG – The Indians came from behind to beat Greeneview, 49-38, in OHC boys basketball on Tuesday. Greeneview watched as a nine-point lead evaporated throughout the third quarter. That lead disappeared when Mechanicsburg’s Chris Taylor hit a three early in the fourth quarter to give the home team its first lead since the early going. Greeneview’s zone had done a good job preventing Mechanicsburg from getting inside in the first half, but had to play much more honestly as the Indians heated up from the outside down the stretch, giving the home squad a bit of room to work down low. Things only got worse for the Rams (5-10) down the stretch, as the competitive Indians pushed the advantage into a large lead the other way. The Indians (5-8) had looked better than the Rams early in the first, but couldn’t knock down a shot and fell into an 8-5 hole, which grew to 21-12 at halftime. Taylor led the Indians with 11 points. Kyle Smith had 10 and Joey Mascadri added 8. In the jayvee game, Mechanicsburg routed the Rams, 43-23. Keith Bebout scored 18 points in that contest for the Indians. Mechanicsburg plays at Northeastern on Friday. https://www.urbanacitizen.com/wp-content/uploads/sites/36/2019/01/web1_JakeEdwards012219_ne2019122195537351.jpgMechanicsburg’s Jake Edwards (33) attacks off the dribble on Tuesday against Greeneview. The Indians had little success shooting the ball early against the Rams, leaving dribble penetration less effective against a defense that was packed in. That changed in the second half, when the home team made a couple of outside jumpers and forced the defense to extend.